well, i've finally made it to all three bill kim restaurants ... the finale being dinner at urbanbelly. urbanbelly recently moved from it's former avondale location to right next door to bellyq, aka right near my office. woo! after glowing reviews from some of my co-workers, one of my gal pals, jessie, & i decided to stop in for a quick dinner last week. and let me say, we were both very glad we did. basically, "urbanbelly is about the communal dining experience. meet new people. eat great food. feed your belly from the heart." does it get much better? 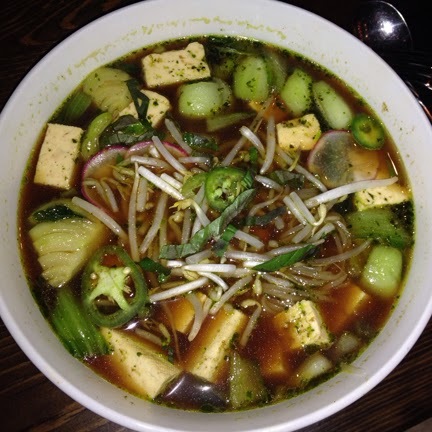 rice noodles w/ tofu, bok choy, sprouts, jalapeño & thai basil. ok, so after i discovered my love for the vegan ramen at wasabi, i think it's safe to say that i am a fan of a mushroom base broth. no actual mushroom chunks, so ok, we're all good. i was still nervous about it here, too ... but this was freaking delicious. and such an ideal dinner dish for this cold weather. great flavor, lots of tofu & noodles ... overall, win. 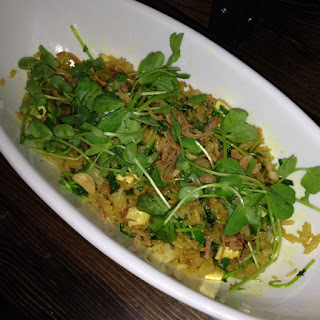 jasmine fried rice with tofu, organic pea shoots & thai basil. no egg. k, let's be honest. fried rice is generally amazing. this version? beyond amazing. so flavorful, so fresh & so perfectly prepared. this is some legit comfort food that i could eat all day, everyday. there are a few other items on the menu that are vegan or can be prepared vegan ... so it's safe to say i'll be back soon.